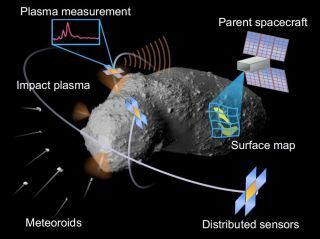 The Meteoroid Impact Detection for Exploration of Asteroids concept mission, or MIDEA, envisions sending tiny robotic scouts to rendezvous with asteroids, then study the material blasted off them by fast-moving space dust. Watching asteroids get pummeled by fast-moving space dust could reveal a lot about the rocks — including which ones might make good mining targets. That's the idea behind a mission concept called MIDEA (short for Meteoroid Impact Detection for Exploration of Asteroids), which would launch tiny robotic scouts to rendezvous with asteroids and then study the material that minuscule impactors blast off them. As currently envisioned, MIDEA would employ 6-unit (6U) cubesats — spacecraft just slightly larger than a cereal box — as mother ships. These craft would journey to near-Earth asteroids (NEAs), go into orbit around them and release five to 10 free-flying "ultralight plasma detectors" that would study the plasma generated by micrometeoroid impacts. Modeling work performed by Lee and MIDEA principal investigator Sigrid Close, an associate professor of aeronautics and astronautics at Stanford, suggests that such impacts occur quite frequently — about one hit per square meter (11 square feet) every 10 days or so for NEAs. "In about two weeks, we should get enough impacts to get an idea of [the composition of] the entire surface," Lee said. There are no construction plans at the moment; MIDEA is just a concept, and much of the current work is focused on developing the technology required for the ultralight plasma detectors, Lee said. The MIDEA team is currently being funded by NASA's Early Stage Innovations program, he added. If MIDEA does manage to go from concept to full-on mission, spaceflight is likely at least five to 10 years away, Lee said. That first mission probably wouldn't take a MIDEA craft very far from home. "I think a LEO [low-Earth orbit] mission would be a good proof of concept," Lee said. "That would make a lot of sense."